Please refer to our stock # T1827 when inquiring. SOLD. 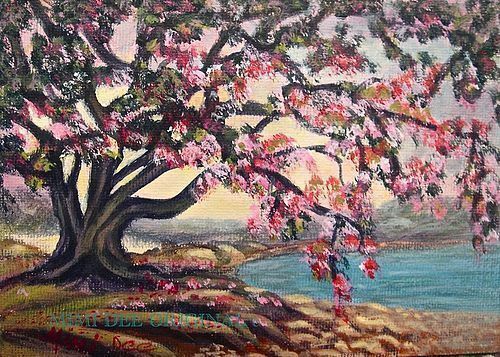 A signed American original acrylic landscape painting depicting a large tree taking possession of the entire scene with its flowering limbs bending over a lake with a rocky beach and a buttery yellow sky background peeking beyond the limbs. Painted by a semi reclusive self learned painter with a semi limited palette of 5 pigments plus white and signed as Mimi Dee with this painting's ID# 0610161009. Title: Blooms at the Lake. Original work by this artist has been exhibited in various area artist association shows since 1998 and at the previously open Methuen studio store gallery by the same name. This painter also makes hand wrought sterling silver sculptural metal work jewelry. For more original fine art work or to commission works by this multi media artist please visit www.mimideeartwear.com.